Dead Island: Epidemic is a new MOBA type game set in one of the most successful kill zombies franchises, Dead Island. Players will have the ability to select a character and equipped with a huge arsenal of handmade weapons, abilities and powers that will be very useful when dealing with hordes of zombies. The game has a PVE mode where we can go solo or co-op, and multiplayer battlegrounds that will PvPvPvE, where we face teams of 3 players. It also has crafting mode where we can create our own weapons. Deadicated Pack comes with the same bonus that Patient Zero Pack, plus two new weapons: Golden Hammer and Golden Shotgun, and The Keghammer, plus an extra hero, titles and credits. 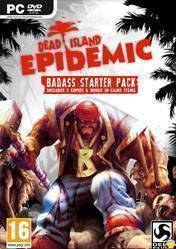 There are no comments yet about Dead Island: Epidemic DEADicated Pack . You can be the first one! Dead Island: Epidemic (Closed Beta) Give away results!! Plus more packs to give away!